So here we are again with A Paper Pumpkin Thing Blog Hop featuring the Blissful Blooms Kit! Let me just say that this kit is GORGEOUS! I love the flowers and the kit itself is very simple yet elegant. It’s a versatile kit for everyday use. A Paper Pumpkin Thing Blog Hop is all about sharing alternative ideas on how to use your Paper Pumpkin Kit along with featuring some other Stampin’ Up! products. Don’t forget that we feature the current months Paper Pumpkin Kit on the last Thursday of the month! Kids are back to school this week for my son’s school district! I’m so excited and happy to have him back in school. It’s been a very busy summer. And, I can’t wait to get back to a regular schedule with both the personal life and business life as a Stampin’ Up! demonstrator. With all the hectic back-to-school stuff going on, I’ve had a bit of a creative block. The Paper Pumpkin Blissful Blooms Kit was a lifesaver for me this week. I was so excited to open it up and create some quick, alternative ideas but to also use the original designs of the kit. So, I have a fun card and 3D project for you this month. Did I mention that I love the August 2018 Paper Pumpkin Kit! The colors are gorgeous. Then there is the beautiful floral motif. Yes, I’m in love with this kit. Now… go and enjoy this month’s projects. I LOVE how this card turned out! I’ve actually taken one of the card fronts from the kit and cut it in thirds. I’ve used both the top 1/3rd and bottom 1/3rd for this month’s projects. On the card, I’ve used a small portion of the card front as designer series paper and attached it to the bottom edge of the card then layered Whisper White cardstock on the top portion of the card. The tag along with some of the vellum leaves and Baker’s Twine pull the card together. Blackberry Bliss is one of the featured colors of the kit. The kit actually includes a small ink spot in Blackberry Bliss. Cut apart one of the card fronts. I’ve cut a 2″ strip off the top and the bottom portion of the card front. Adhere one strip of the Paper Pumpkin card front to the card base. Now, cut a piece of Whisper White cardstock measuring 3 3/4″ x 4 1/4″ and attach to the top portion of the card front. Stamp the “Thank You” with Blackberry Bliss Classic Ink on the skinny banner from the kit. The stamp is included as part of the Blissful Blooms Paper Pumpkin Stamp Set. On the back of the banner, add snail adhesive and attach the vellum leaves. Next, adhere the Baker’s Twine. Overlapping the Baker’s Twine, add Stampin’ Dimensionals to the skinny banner. Adhere the skinny banner to the card front just overlapping the bottom edge of the Whisper White card front. Finish the card with three Rhinestone Jewels. This second project is a lot of fun and even offers an alternative use to the Acetate Card Boxes! For this treat holder, I’ve cut the Acetate Card Boxes in half then added a cute decorative flap with a velcro closure. It holds NINE Hershey Nuggets. Emboss the Acetate Card Boxes with the Layered Leaves Textured Impressions Embossing Folder. To emboss, slip the acetate box onto the embossing folder making certain to emboss the side with the box closure. Score the Blackberry Bliss cardstock at the 3″ and 3 5/8″ inch marks. Adhere the original Paper Pumpkin Card Front measuring 1 3/4″ x 4 1/4″ to the smaller flap. Stamp the sentiment on the narrow banner with Blackberry Bliss. Add snail adhesive to the back then attach the green vellum leaf along with the Baker’s Twine. Adhere a White Vellum leaf directly to the decorative floral paper flap. Finish the 3D Treat Holder by attaching the narrow banner to the flap along the bottom edge. Fill the box with treats or any other items that fit. To continue on with the next blog on the OSAT Blog Hop, you’ll want to visit Rick Adkins! I’m certain you’ll enjoy the projects he has to share with you! To view his blog, you can click on his name or on Rick’s name in the Blog Roll below. Paper Pumpkin Blissful Blooms Video by Stampin’ Up! 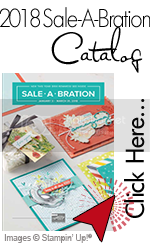 Interested in starting a business or are you a Hobby Stamper? There’s no risk! Do it for FUN! Do it for YOU! Hobby Stampers are always welcome to join the CREW! Pam ~ these are such cute alternate projects! The note card strips make perfect accents. Outstanding, Pam! I particularly like the treat package, it’s a beauty!